Artificial Intelligence & Marketing: Best Friends Yet? AI is now the new mystical Jedi – the panacea for most ills in marketing. Many marketers remain hopeful about its ability to solve few age-old marketing dilemmas. Yet others view it sceptically as new age marketing voodoo. What perhaps might be a different approach is evaluating what are the biggest challenges that marketers face today? Are any of these problems solvable at scale through AI? Few of the problems that have plagued marketers─those who that don’t have gargantuan budgets and resources to solve these perpetual problems are outlined below. #4: Voice Commerce: How can AI help? If there ever was a holy grail for marketers, it has been this, always – the 360-view of the customer. Mystical, ever elusive but an important marketing artefact nonetheless. A lead views a Facebook ad, clicks on a Google Ad, calls up the customer service and buys in store, leaving marketers with flummoxed with attribution analysis problems. Large enterprises may have resources at their disposal that can help address this problem. The challenge is addressing this problem at scale so that even smaller businesses can derive engagement value. Customer data seems to emerge from everywhere: submitted data (CRM forms, opt-in communication), transaction data (purchase records), customer service data (service tickets) behavioural data (page views, clicks, likes), apart from an avalanche of email data, website chats, social media and other online chatter1,2. Creating actionable insights from multichannel data can be tedious and complex. So, can AI help in presenting a complete 360 view of the customer? Apparently, yes. Customers expect a consistent and cohesive experience, want lesser (perhaps no) ads, more personalized experiences with the least intrusion. AI can offer the ability to identify not only the 360-degree view of the customer but also a systemic migration of low –margin customers to higher-margin customers, advanced purchase propensity models, and much more. So, solving the Single Customer View (SCV) challenge through AI tech at scale remains one of the fundamental tasks of marketing. Customers vigorously and vehemently defend their right to privacy – and rightly so. Location, language preferences etc are guarded zealously to prevent anyone from identifying our online footprint. In this data-sparse, recommendation engines have their task cut out – even more so stringently than before. Recommendation engines act as a discovery aide – whether it’s people you may know, videos you may like or frequently bought together, recommendation engines are your personalized digital assistants. Of course, the maxim here is that get the data right, and the entire customer experience can be tailor-made by using data science. The challenge is to deliver more personalized and relevant recommendations with data being the limiting factor. As lesser and lesser data is available, the associations required to deliver recommendations would be lesser and lesser linear. Here, behavioural data can come to the rescue as intelligent recommendation engines improve with every interaction, learning more about what is important to each individual visitor, allowing it to make increasingly more accurate suggestions that are more likely to appeal. This is the problem that marketers need AI to solve: how to deliver a more personalised relevant experience in a data-scarce environment. One of the metrics of success for any marketer is correct long and short-range forecasting. Whether it is revenue, costs, or behavioural customer data, forecasting is an integral component of a marketers’ lifecycle. Forecasting still derives some value from human judgement (consistently optimistic vs consistently pessimistic projections), allowing for discrepancies that can wreck any forecasting model3. Current forecasting applications are limited in their scope and ability to integrate multi-factor inputs and offer limited options for course corrections. The ask that marketers might have from AI is how the variance between the actual and estimated forecasts can be narrowed without human intervention? To eliminate any inefficiencies in forecasting due to subjective human assessments and assumptions, can AI forecast methodologies incorporate market dynamics, fluctuating consumer sentiment and other market variables? comScore forecasts estimate that $1.2 trillion searches will be done by voice by the year 2020, representing around 50% of all searches. By the year 2022, it is estimated that $40 billion in commerce activity will be done via voice4. Conversational AI has been around for some time, and as the adoption of voice commerce increases, marketers will scramble to capitalize on this new point of purchase. The inherent convenience of voice commerce for routine, mundane shopping experiences, such as reordering, is expected to enhance societal adoption5,6. Marketing professionals need to focus increasingly on voice as a strategic initiative and appreciate that voice searches are inherently different than voice searches. The thing to watch out for is how AI can leverage natural language processing to analyse conversation tonality, contextual conversational cues, user habits and preferences and solve the problem that has been plaguing marketers for quite some time now – can we correctly predict the true intent of search? This year was a watershed event for all marketers. Adopting GDPR symbolized a mindset change to marketers used to treating customers’ data with impunity. This EU regulation was enforced in May 2018. The regulation built on requirements for data privacy and security, and includes several new provisions to bolster the rights of data subjects and add harsher penalties for violations7. However, AI interventions are expected to run into strong headwinds post-GDPR. Big data and data protection are irreconcilable. And enforceability of AI in marketing is dependent and driven by data. It would be interesting to see how AI delivers its promise amongst increasing clamouring concerns for privacy and data protection. In conclusion, if AI is able to render viable solutions to few of the biggest marketing challenges listed, this may just be the beginning of a long and sustainable relationship. Its success would also depend on how wholeheartedly marketers adapt and embrace artificial intelligence, intelligently, keeping in mind the tectonic changes in privacy and data concerns. 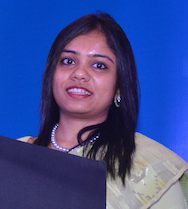 Sumedha Chatterjee is the Head of Marketing at BMJ and handles a diverse portfolio of print and online products. Prior to this, she headed the marketing for a quick growth startup in the e-learning industry. She has been published in magazines, newspapers and national journals. She is passionate about content, social and tech — and is an avid blogger.